I want to float an idea but don’t have time to develop it into a full-fledged argument. Still I want to propose a reading for an unusual text we find in the Synoptic Gospels. Since Mark is likely the first Gospel written, I’ll work from there recognizing that what is true for Mark is also true for Matthew and Luke. For years I’ve puzzled over the description of the John the baptizer as eating locust and honey (Mark 1:6). Translations differ. Some seem to underscore that John’s diet consisted of locust and honey as if that was all he could get in the wilderness (NLT, The Voice). Other versions don’t interpret it at all. Many commentaries notice the statement but have little to say about it. I’ve wondered why we are given this bit of information in a hard-hitting, fast-moving Gospel like Mark’s. After all we’re not told Jesus’ diet, and he’s the main character in the story. Is the statement about John eating (present participle; Mark 1:6) designed to present him as a desert-dwelling ascetic with odd habits? If so, that seems to fail since locusts are kosher and though most westerners cringe at the thought of biting into one, it would not strike a person of John’s day as strange. Then there is honey, a desirable natural sweetener on everybody’s wish-list. So what is the point? Well let me suggest a reason. The description of John and his activities (living in the wilderness, preaching, baptizing, and his manner of dress) are part of John’s prophetic message. Where he was, what he was doing and how he did it were key aspects of his person and mission. Prophets were known not only for speaking a message but also acting it out on occasion. This is uncontroversial. Isaiah (ch. 20) walks naked for two years to portray what would happen to the Assyrian captives of Egypt and Cush. Jeremiah (ch. 32) buys real estate as the barbarians are at the gate to depict a hopeful future after the exile. Ezekiel (ch. 4) famously constructs a small model of Jerusalem, portrays a siege against it, lies down on his left side for 390 days as a sign to Israel of things to come. Then God instructs him to lie on his right side for 40 more days and prophesy against it. Prophetic words were certainly memorable but prophetic actions garnered even more attention. My proposal is this: John ate locust and honey as part of his message. So we shouldn’t imagine John sitting behind a rock snacking on locust and honey right before a big sermon. Rather, I suggest he makes eating locusts and wild honey part of his sermon. So what would/could this mean? Well consider the prophetic record and what locusts represent. Joel may be the best place to look. 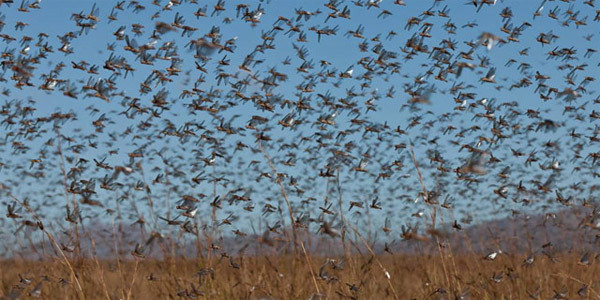 An invasion of locusts offers a sign of things to come when an army invades from the north and strips the land bare. Locusts then are a sign of judgement. God’s people have behaved badly now disaster was going to come upon them. Yet even as judgment is announced there is a conditional promise of salvation. If God’s people will repent, return to God, and plead with God to deliver then, then God will restore to them everything the locusts have stripped away (Joel 2:12-27). Joel 2 ends with a triumphant declaration of God’s salvation when he pours out his Spirit (Joel 2:28-32). As many will recognize this passage is picked up in Acts 2 as Peter’s interpretation of the day of Pentecost: “This is what was spoke of through the prophet Joel” (Acts 2:16). Anyone who heard John in those days would have gotten the idea that the current invaders and consumers (the Roman occupiers) were going to meet their match when enough of God’s people repented and submitted to John’s baptism. The long day of judgement was coming to an end. I can imagine John lathering his hand in honey, putting it to his mouth and savoring its sweetness as he stood in front of a group of pilgrims from Jerusalem or Judea proclaiming the imminence of God’s kingdom and warning his detractors of the coming judgment if they persisted in their hypocrisy. John could have simply spoken the message but by dramatically acting it out, it had a much greater influence on those who came to see him in the desert. Now this is just a proposal. It is not a full-fledged argument. Still it makes sense to me of a puzzling text. I welcome your thoughts and comments. Sometimes the idea of honey in the Old Testament is related to the Torah (Law). In case it is something that flares up in your mind, I don’t mean the law that we’re no longer under, but rather the words of God to Israel through Moses. As prophetic utterance, they were rejoiced in. It was the extra teachings added to these words that made them burdensome. The rabbis would take slate and write out the commandments upon it with honey, and then have their students lick the honey off – a symbol of God’s words being sweet like honey to us. They would also sometimes put candy over the name of God, so that when the student came to the name, they would associate it with something sweet. I do agree that the locusts are about judgment. Together we have judgment and torah, or maybe we can put it, “mercy triumphs over judgment”? As far as sermon illustrations, I’m not so sure of that one. John wore camel’s hair and a leather belt. Compare that with 2 Kings 1:8. It is Elijah. I wouldn’t doubt if there is something intrinsic in this aspect of John’s description that is also being referenced back to something – whether Scripture or tradition, I’m not sure. The point is that his appearance was that of Elijah’s, because he took on the role of Elijah’s ministry. His words were of judgment and torah – the very prophetic utterance spoken by all the prophets throughout all ages. Maybe this helps with your considerations? Grace and peace in Christ, dear brother. It’s plausible. I like your idea that John is using these items to make a point. As always we have to speculate at the context (being another time and culture), but your use of Joel and Peter seems as good a approach as is possible for us to understand the context. I’ve found one way to flesh out ideas is to pull exegetical interpretations from other cultures. Particularly ones that aren’t Western trained like Indian, Chinese, Coptic, and Eastern Orthodox, but even using French and German scholars tends to help in this way. The idea being to balance our cultural biases and give a fuller understanding of Scripture.